HEMPSTEAD, Texas – The dream is always the same, and it’s always draped in gold. For rodeo cowboys, every step of their lives and their livelihoods is guided by that dream, of winning the world championship. The vision involves riding great steads or handling untamable bulls. The brilliant visions of gold buckles include important stops along the way, and that’s what will drive the very best in ProRodeo to the Waller County Fair and Rodeo, set for 7:30 p.m. Thursday, Sept. 29-Saturday, Oct. 1, at the Waller County Fairgrounds in Hempstead. A big part of the draw for contestants is the bucking horses and bulls provided by Pete Carr Pro Rodeo, which has been recognized as one of the top livestock firms in ProRodeo for several years. “What we love about Pete Carr is that he has the kind of stock that attracts world champions and regular NFR qualifiers,” said Clint Sciba, the fair board’s president and co-chairman of the rodeo committee. “There’s a reason that Pete has been nominated for stock contractor of the year. He should’ve won it already. It’s not just Carr’s incredible bucking stock; one of the key aspects of Pete Carr Pro Rodeo lies in its production. The Carr crew works diligently with the Waller County Fair Board and rodeo announcer Andy Stewart to make sure each performance is considered world-class. 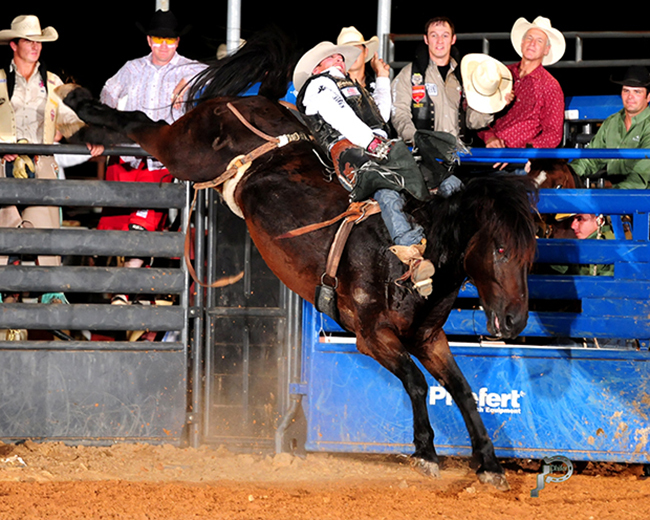 In fact, world champs and NFR qualifiers have become staples of each of the three performances of the rodeo. “The reason Pete’s rodeos are so tough is because he has so many great horses,” said Richmond Champion, a 2014 NFR qualifier from The Woodlands, Texas. “Any rodeo you go to, you know you have a chance to win on anything he’s got. That makes it exciting for us. He’s had his fair share of success on Carr animals. From a victory in Cheyenne, Wyo., to a go-round at that season’s NFR. Now he’d like to carry that over to a rodeo that’s very close to his home and his heart. It all adds up to a winning combination at the Waller County Fair and Rodeo.